The world is continuously changing, facing new challenges every day, modifying its demographics and cultural characteristics. These changes are enormous and felt in the United States of America, the size and impact of the nation make it so that they face lots of it fast and under the lens of the rest of the world. So, realtors, are you ready to embrace these changes? Are you prepared on demographic trends and how they affect your market and business? Market demographic trend #1: Millennials will become the largest generation in the U.S. 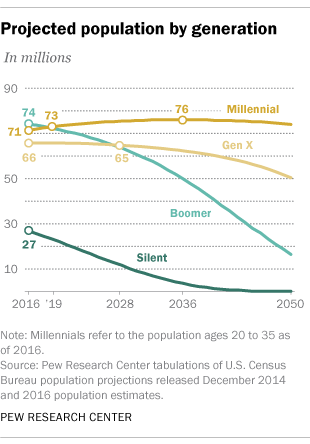 The Pew Research Center, based on projections from the U.S. Census Bureau, estimates that the millennial generation will grow to be larger than baby boomers in the U.S.A. by 2019, this demographic trend means that millennials will be the largest generation. Real estate has already been affected by this trend as millennial homeowners are increasing; with the recovering economy, their careers are advancing, gaining more comfortable economic positions, and tackling student debt gets them on a situation where they’re more prone to buying a house. The housing market is shifting to the likes of a newer generation, a generation that uses technology for their everyday lives and looks for information online and on their mobile devices. This shift from getting the information right from the realtor to researching everything online changes the real estate agent’s role a lot, their power now relies on first hand and in-depth knowledge of the housing market dynamics and negotiation skills. Technology is very imprinted in millennials way of living so they expect that businesses, big or small, that offer any service make use of the available technology to better their offerings through live streams, and video showcasing, for example. It is also important to understand how to communicate with the millennial market demographic, as they prefer a more quick and direct approach to speak with realtors by using text messages instead of phone calls to get information, show interest or request appointments. Technology and demographic trends have such an impact on a business that this affects the market’s nature and behavior, with rising startups coming up with new solutions to satisfy the needs of millennials, like portals for easy home research, financial aid, credit ratings, virtual reality, and much more. Millennials also have different priorities, they take their time to study, to reach professional fulfillment, economic stability, travel and enjoy life before engaging with a loan, a mortgage, or settling down a family. All of these cause that millennials look for homes at a much older age than the previous generation counterparts. Marriage and children increase a person’s chance of owning a home, but the youngest generations are marrying less, pushing the median age for marriage to around 30 years old and have a more likely never to marry than older generations were. Children are also kept out of the picture for longer than before, according to the CNBC married households with children were at 37% in 1990 and dropped to a whopping 25% by 2015. As Brookings shows in the following picture, the U.S.A. diversity keeps growing. Millennials are a bridge between generations when it comes to racial diversity, with older generations having a greater white majority while new ones have larger minority groups. This effect comes from immigration influx being at a historical low point when it comes to the older generations, and the ones who did come were mostly white Europeans, making those generations highly white and with smaller minority groups. In recent years, the white population has been growing older, and with the immigration waves of Latin American and Asian groups in the 80s and 90s, there are now more diverse generations coming up and changing the market demographics. The racial diversity in the U.S.A.’s 327 million population brings to light more cultural consciousness and obliges realtors to keep their head in the game by really getting to know the market demographics, keeping up with the trends, and understanding the needs of each group and the role they play in their businesses. The Hispanic population is estimated to be at 55 million in the U.S.A., and they mostly live in states such as California, Florida, and Texas. They make up 18% of the nation’s total population, reaching a new high in the U.S.A. but the growth is slowing down. 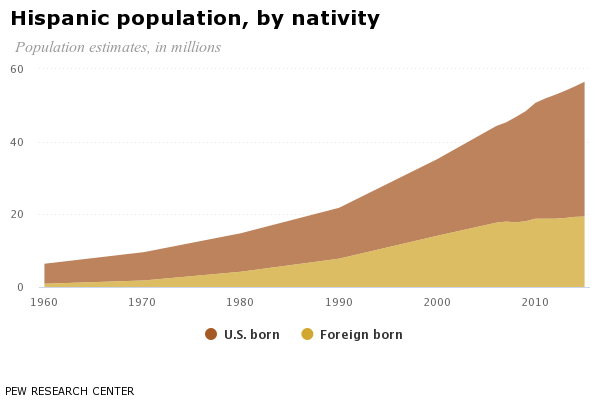 The demographics of the Hispanics consists of U.S. born and foreign-born people, their origins very diverse as they come from many different countries. According to the Pew Research Center, most of them have Mexican origins with a 63% immigrant population that has been decreasing over the years with fewer people arriving at the U.S.A. and more leaving the country. Another interesting fact is that 57.5% of them are bilingual, speaking Spanish and English; there’s also a 2.6 million non-Hispanic population that speaks Spanish in the country. The National Association of Hispanic Real Estate Professionals has reported that the number of people from this population to own a home in the U.S.A. has almost doubled from the year 2000, and this growth has been a constant in the past three consecutive years. This demographic trend is already affecting your business and will continue to do so, but it also represents a significant opportunity. Adapt your approach to this market share and pay close attention to their characteristics, having focused proposals for Hispanics and tailoring your communication to how they do it will give you a significant advantage over your peers. The way the world’s economy has evolved has brought a housing price surge, which people have come to deal with it by sharing their homes with other people. This demographic trend means that 32% of the adult population have turned to shared households as a living arrangement. Most of the time the home arrangements constitute of adults living with their parents as younger generations take more time to leave their parent’s home, and a lot of the times professionals share their homes. This trend affects real estate because adults are sharing their home with people that are not students or their significant others, the way they constitute a home is changing. A shared household is usually a multigenerational one, “a shared household is a household with at least one adult who is not the household head, the spouse or unmarried partner of the head, or an 18- to 24-year-old student.” according to Pew Research. This demographic trend is because a lot of adults are now moving back to their parents home after finishing their studies and parents are moving in with their children, but it is important to note that the shared household panorama doesn’t include student living arrangements nor underage children who live with their parents. Birth rates had been down for years, reaching the lowest record in 2006. Now, the demographic trend is going up with 86% women at the end of their fertility years already having given birth to their children by 2016. Another interesting demographic trend is that more non-married women have been giving birth. According to the Pew Research Center, 55% of early 40 year-olds in 2014 had given birth without being married. Meaning that family constructions are changing too, with people marrying less or later and having families that are not necessarily delimited by marriage. How can you keep up with all this market demographics that shape up the real estate industry and affect your business? As mentioned before, the best approach is to be conscious of the different demographics that are part of the market, how they behave, what’s important to them, and how much their buying power is growing. The best way to deal with demographic trends is keeping up with the world, expanding your knowledge about the dynamics and coming up with new ways to attract the demographics you’re looking to be your customers. 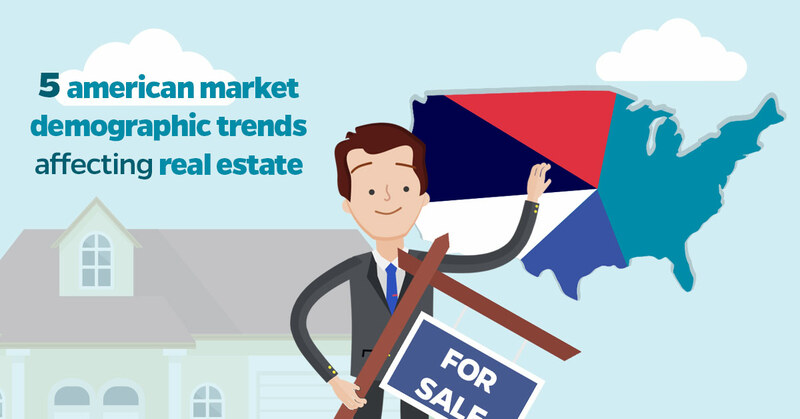 Most importantly, be informed of these trends in your area, the role the demographics play where you’re based and how they change and shape the local market. Involving technology, coming up with new housing solutions, and personalizing your offerings are a big must for the upcoming years; knowing your potential customers, who they are and what they like will allow you to have an offer that is tailored and attractive to them. What are the most drastic demographic changes you’ve seen in your area? What tactics have you used to keep up with the market shifts affecting your business? Pss.. Have you already checked our real estate CRM and try our easy Integration? Do you want to get more content like this one? join our newsletter to stay update on latest marketing and lead generation news and tips!